We pay CASH for your unwanted metal items. All you have to do is drop off your metal at our recycling yard, and we will evaluate the cost of your scrap metal based on current industry prices. The scrap yard is open to the public for drop-offs from 7 am - 3:45 pm, Monday - Friday. We offer pick-up service for commercial accounts only. Learn more about how we pay. For those located out of state (Maine, New Hampshire, Rhode Island and Connecticut), we offer pick up services. 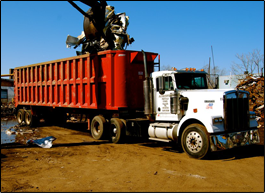 As long as you are within the territory we cover, our metal recycling truck will arrive and pick up your scrap metal and deliver it to our recycling facilities in Lawrence MA.